The SuperAttic™ System converts your attic from vented to unvented while still maintaining a vented roof assembly by installing SilverGlo™ radiant barrier. 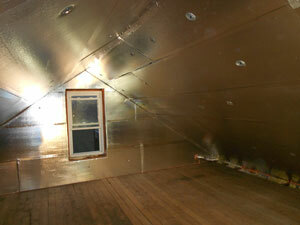 The attic plays a critical role in a home's energy performance. The average house wastes hundreds of dollars on heating and cooling every year because it has too little attic insulation and too much air leakage into the attic space. That's why building performance experts place a high priority on air-sealing the attic and upgrading attic insulation. The trouble is that many attics are partially or fully floored to provide additional storage space. It's not possible to air-seal the attic and install extra insulation unless you rip up and remove the attic flooring - a messy operation that adds extra expense to this energy upgrade while eliminating a valuable storage area. Dr. Energy Saver has the perfect solution for this kind of situation. Our SuperAttic™ insulation system provides you with insulation you need without taking away storage space. Contact us today to discover if SuperAttic™ is right for you! The SuperAttic™ system from Dr. Energy Saver eliminates the need to remove attic flooring and lose valuable attic storage space in order to make major energy-saving upgrades in the attic. The SuperAttic™ system utilizes proprietary SilverGlo™ rigid foam insulation panels to fully seal and insulate the attic directly beneath the roof rafters and directly inside the gable ends. The SuperAttic™ system creates a continuous air and insulation barrier directly beneath the attic roof, with no thermal bridging to compromise energy performance. With the SuperAttic™ system, roof ventilation is maintained without allowing exterior air to enter the attic space. As an added benefit, SilverGlo™ insulation panels include an integral radiant barrier that further reduces heating and cooling costs. Each SilverGlo™ insulation panel is sealed to attic framing and to neighboring panels, creating a thick layer of insulation that includes a radiant barrier. Building scientists, the experts who study how buildings use and lose energy, have known for years that a house loses more energy through the attic than anywhere else. Inside the house, warm air rises naturally and leaks into the attic. Air leaking out of the house is replaced by unconditioned air from the outside. It can be a challenge to fully air seal an attic, while traditional insulation options are insufficient and eliminate storage space. Dr. Energy Saver invented the SuperAttic™ system to overcome common attic insulation and air-sealing problems and offer homeowners a high-performance alternative. SilverGlo™ rigid foam insulation is durable and waterproof -- it won't shrink or lose R-value over time. Roof ventilation is maintained, but outside ventilation air is kept outside the attic space. Once and done. A typical SuperAttic™ installation can be completed in one or two days, and is a permanent, no-maintenance, "green" home improvement. I would like to use some of my attic space for storage. If more than two of the statements above apply to you and your house, a SuperAttic™ system could be a smart investment. Call or contact your local Dr. Energy Saver dealer online to get started with an inspection and installation estimate! 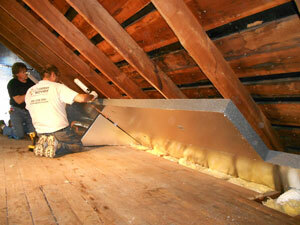 We provide complete attic insulation services that will improve your home's comfort and energy efficiency.